Madison, WI--Full Compass Systems recently hosted a Steampunk-themed Gala celebrating the 30th anniversary of Madison Ballet. 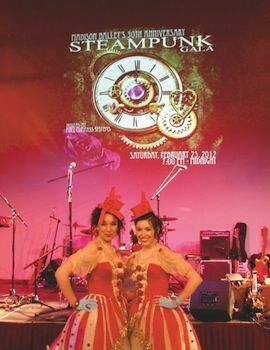 The evening was an over-the-top experience for nearly 200 guests costumed in Steampunk attire. Those attending enjoyed appetizers, a specialty cocktail, an extravagant dinner, custom chocolates created exclusively for the event, and live music and dance performances throughout the evening. Madison Ballet was originally founded in 1981 as The Wisconsin Dance Ensemble. In 1999, the organization expanded to become a traditional ballet company, staging one or more large-scale productions each year. The opening of the School of Madison Ballet in 2005 made available a high-level, comprehensive ballet training program for young dancers and adults in South Central Wisconsin. Full Compass, supported by the cooperation of employees, friends and family, donates substantial funds and time each year to several music-oriented and non-profit organizations.